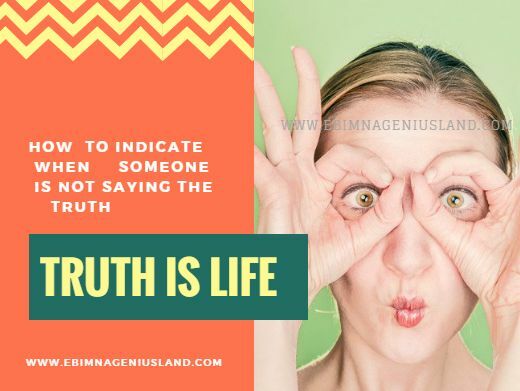 The truth is meant to be said at every moment and says of our lives, many people have really turned lying into their professional business, to the extent that they can't live the whole day without lying and they call it a small sin. When the truth is discovered everyone is expected to know the truth because as long as the word of God is concerned, there is no small sin and big sin. The Holy Bible called sin, Sin. When you want to indicate and know when someone is lying to us, we must be ready to be actively active, in order to stand and be able to understand the tricks involved. If you want to indicate someone who is lying and one who is saying the truth, you must be an honest human being, don't be among those who are busy trying to remove someone a small paper on their slippers, while you have a big pair of stick in your eyes, which has not yet been removed. When you are receiving a report from someone, you are expected to be quiet so as to know where you might ask questions in the whole story report. But, when someone is reporting to you and you are as well talking or busy thinking of one question to ask, you are not going to be able to judge and indicate the truth, rather you will end up making things worst, or even implicating yourself. Many people are failing it especially when it comes to judging reports, they don't wanna know what the other person said, or what the other person might have to say, but because the first person reported first they will first accept that he/she is the one saying the truth. It's very wrong to condemn someone from the judgment that is one side, you must have to listen to the other person, then you will balance to two words and know who is saying the truth, and who is not. If you have noticed, you will realize that when someone is lying, his/her heartbeat is very fast and also, he/she is really under pressure and also always sweat the most, unless if the person is a type that sweats so easily, no matter the kind of discussion you are having with the person. When you listen to the voice of someone lying to you, there must be a sign of pressure or shake in the voice to compare to the way the voice sounds when it's saying the truth.